J.D Ledford is a joy to listen to, very active and truly committed to the story. I don’t think I’ve ever listened to a narrator as lively as her performance. The imagery in this story is ethereal, I don’t know if it was J.D. Ledford’s soothing tone as she played out Bellamy’s actions that really gave life to the words, but the writing is beautiful regardless. Chasing the Signal packs a lot into a short space. Fast paced and with a moving family drama at its heart, we are introduced to three generation of one family, 10 year old Bellamy, her bitter and abusive mother Grace, and her grandfather who has takes them with him on an interstellar journet to chade an alien signal. Relationships are strained and Bellamy is forced to take charge when their ship comes under attack in deep space. Really enjoyed the production and the story could have easily been expanded to a full length novel. I would recommend to those that like space adventure stories with strong human element. Full disclosure I was given a discounted copy of this story for fair and honest review. You know you've enjoyed a book when you feel it ended too soon! Looking. Forward to the continuation of her story. It's the kind of story that made me fall in love with SciFi years ago. Written with imagination, excellent characterization, wieldiness with words and above all, heart, Chasing The Signal isn't missing a thing. Ledford's on point, bringing the work to audible life. I'm looking forward to more Audible versions of Mauldin's work. I really enjoyed Chasing the Signal. Solid story. Solid writing. Solid performance. Mauldin managed to accomplish quite a lot in a relatively short span of time. I found myself a little bit lost at the very beginning, listening to the first couple of minutes 2 or 3 times to get my bearings in this new world at which I had just newly arrived. The context of the world came quickly enough though. 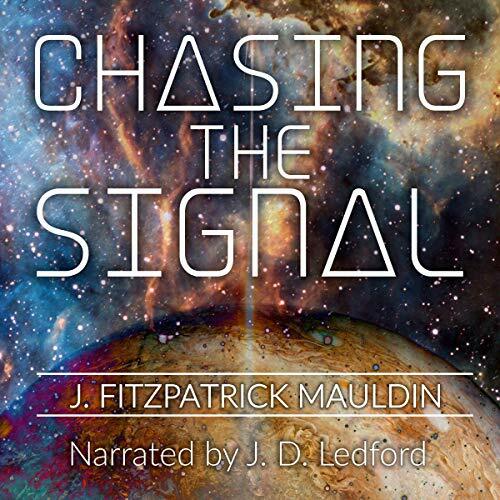 In the end, Mauldin has crafted a relatable future world with really cool tech, baddies I want to know more about, and a lead character who I want to follow on more adventures. Loved it! Such an imaginative story with a future for more! Can’t wait to see more! This sci-fi short story was unlike any sci-fi I’ve seen yet. Imaginative technology mixed with family drama and a narrow escape. It was a fun listen. I want to see more in this universe, explore all the races, cultures, and technology!